Haste makes waste. He who hesitates is lost. Which is right? Action without vision is a nightmare. Vision without action is a daydream. Which is right? In both cases, it depends. Each of the apparently contradictory aphorism pairs makes perfect sense in a particular situation. The trick, of course, is to know which situation faces us. In the same vein, consider “trust takes time,” and “trust your gut.” Which is right? Is trust gained only with the passage of time? Or is it something that comes in a flash, a moment of intuition or feeling? Most people in business, if asked without reflection, will come down on the side of “trust takes time.” And their approach to selling reflects this. They believe that people buy after they come to trust the seller; and that this trust is based on a track record and a history of promises kept. The belief that trust takes time is true enough—but it’s only about 25% of the story. The rest of the story is a story of trust that hardly takes time at all. And that the sales process—far from depending on the prior establishment of trust—is itself ground zero for the creation of trust. The tendency to over-weight the importance of time in establishing trust isn’t just limited to sales. It is reflected in other parts of business, and of society, as well. 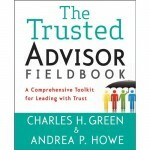 In his recent book, The Speed of Trust, Steven H.R. Covey Jr. links trust, time and cost: as trust goes down, speed goes down and costs go up; as trust goes up, speed goes up and costs go down. A few years ago, Warren Buffett bought McLane Distribution, a $24 Billion food distributor, in a $1.5 billion transaction. He did no due diligence beyond a 2-hour meeting. Buffett said, “I trusted Wal-Mart, I trusted the people I worked with.” This decision saved Berkshire Hathaway millions in foregone legal and accounting costs; total elapsed time, one month. The US auto industry is notorious for its history of combative relationships with employees (the UAW) and its various suppliers. By contrast, the Japanese auto industry has seen its suppliers as integral parts of a larger system. The resultant lower costs per car probably contribute more to the Japanese industry’s competitiveness than the US industry’s health care and pension costs. The general business costs of low trust are massive. Think of the expenditures on legal fees. The added accounting costs based on Sarbanes Oxley. The costs of disclosure. Of regulation. The burden of low trust shows up in sales as well—and, like the auto industry, much of it is the fault of sellers ourselves. Seeking sales “efficiency” by tightening qualification processes means giving up face-to-face marketing with potential future clients or referrals. The focus is on our own immediate needs. Result: trust down, costs up, time longer. Defining sales mainly as a process dehumanizes it. Outsourcing sales over-emphasizes the economic self-serving component of sales, at the cost of client focus. Result: trust down, costs up, time longer. Shortening evaluation timeframes and cranking up reliance on monetary incentives over-emphasizes the monetary and transactional aspect of sales. Result: trust down, costs up, time longer. Even in the sales call itself: “trust takes time” only in part: the part that has to do with reliability. Most other forms of trust come from the “trust your gut” dictum. Which can be far faster. And far cheaper. Of these four factors—credibility, reliability, intimacy and self-orientation—only one of them necessarily requires the passage of time. That factor is reliability, because by definition it requires repeated experiences. The emphasis on reliability is what drives so much of the approach to selling primarily used in professional services: references, lists of past clients, success stories, resumes, and processes. All are heavily built around the idea that being trusted accumulated experience built over time. But reliability is only one factor of four. And the other three often, sometimes mainly, are created in a conversation, even a moment. Credibility is established not just in histories, but in symbols, credentials, and insights—and in a firm handshake, a look in the eye, and a straight answer. Intimacy is established not only by knowledge acquired over time, but by a knowing nod, a sense of empathy, and a recognition of the personal. Self-orientation is not just established through a history of customer-focused behavior, but by how we conduct ourselves daily, what questions we ask, and whose concerns dominate our reactions in the moment. When these areas of rapid trust creation are understood, it follows that we don’t have to wait for the passage of time to be trusted. To a great extent, we can demonstrate our own trustworthiness—and thereby earn the trust of our clients—in the sales process itself. Selling doesn’t depend passively on the development of trust; selling can itself be the engine of trust creation. Learn more about The Trust Equation. Give up spin control. Speak the truth—simply, plainly, without embellishment. Answer questions directly. Don’t withhold truth. Behaving this way builds credibility rapidly—often within a single conversation. You become known as a truth-teller—one who places integrity and honesty over outcome. Truth-telling enhances credibility more than carefully doling out truth. Admit your limits. If you don’t know something, say so. If you’re not the best at something, say so. If you don’t have all the answers, say so. If you’re not clear on something, say so, along with what you are clear about, and what you need to get clear on the rest. This enhances your credibility (after all, who lies about their ignorance? ), and your intimacy in your willingness to be transparent. Offer other approaches. If the only recommendation you ever have for a client is “me/us,” then no client can ever trust your recommendation. Have recommendations for alternative providers if the client can’t afford you, or wants an answer sooner than you can deliver, or requires services that aren’t cost-effective for you to deliver. Having alternative suggestions shows high client focus and low self-orientation, as well as enhancing your credibility. Take an emotional risk. If you’re feeling something, say it. If you notice an emotional fact about the client (distracted, passionate, concerned), comment on it (“you seem a little distracted,” “I get the sense you’re really passionate about this,” “I’m sensing some real concern from you about this one aspect”).There is no trust without risk, and you can’t expect the client to lead on risk-taking. The most common form of risk is emotional risk—the intimacy factor—and the inability to be open about emotions. Enable that openness. Do it with respect for the client and with appropriate caveats—but do it. Address the other two agendas. Of course, state your own agenda for a meeting. But that’s only one agenda. There is also the client’s agenda—ask for it.Finally, there is a third agenda—the agenda for the relationship itself. Not every meeting needs a specific relationship agenda item, but the question ought to at least be raised—“do we have a chance in this meeting to improve our relationship?” Raising the other two agendas lowers your self-orientation. Give up control in the meeting. Of course you want the sale. Of course you can’t give away work for free. And of course you should define objectives and agendas for each meeting. But once in the meeting—let it go. Give up control. Simply help advance the best long-term interest of the client and the relationship. That demonstrates your willingness to collaborate, and your lowered sense of self-orientation. Deliver on more promises. This one has to do with reliability. Reliability is the one factor that by definition takes time, but there are ways to shorten it. Make more promises; then keep them. Say you’ll end the meeting at 11:00—then end at 10:59. Say you’ll deliver the package by tomorrow; then have it there at 9AM. Promise short-term follow-ups, and then deliver. (And don’t make a habit of over-delivering—that just undercuts your credibility. The occasional over-delivery helps—reliability is enhanced by a history of dependability, not by surprises). Always context transactions within relationships. Don’t approach sales, or negotiations, or even meetings, as if they were stand-alone events. Link them to future sales, other negotiations, future meetings. Doing so demonstrates collaboration and a commitment to client focus—all of which helps raise credibility and lower self-orientation. Trust your gut. Much research on the establishment of personal trust suggests it happens very rapidly—often instantaneously. Sometimes this can be dangerous for the one doing the trusting—that’s why con artists make a living.However, gut instincts help us deal efficiently with complex lives. Our “gut” is capable of very sensitive, discriminating and highly accurate judgment—with respect to all three factors of credibility, intimacy and low self-orientation. If others are willing to trust their gut, and your own intentions are clean—then help them do so. We don’t have to wait for the passage of time to create trust, and then the right to sell. We can develop trust within the sales process itself—rapidly, and legitimately.